Alice in Wonderland... is a real feminist! I just saw the movie. Against all odds, after watching a Disney movie, I left the theater with thoughts on feminism, society and rebellion. The parallelism drawn between the real world and wonderland is too striking. Alice refuses to wear a corset and stockings: "who's to say what's proper? ", she revolts against her mother: "if they told you to wear a morgue on your head would you wear it? ", lends a deaf ear to her conventional sister's advice "you don't want to remain a load on our mum.." and stands up against what society expects her to do (get engaged). Furthermore, our dear Alice publicly says no to her potential fiance, (what others perceived as a unique opportunity as he was rich with a good social standing) and carelessly talks back to her potential fiance's mother. Moreover, Alice threatens her sister's husband (twice) when she sees him cheating, and aggressively gives her unconventional opinion in business matters (a field that was not perceived as proper for girls). In the other realm, Wonderland, Alice takes matters into her own hands "ever since I got here I was being told what to do!" she complains, she defies what she has been told (recklessly goes to the red queen's castle to save her friend), and finally does what she was destined to do, be the "champion" who saves the realm from evil. The long awaited savior... is a woman! ...And have you noticed? All positions of power are actually held by women in the movie! The mother heads Alice's home and the Fiance's mother seems to rule in his house. Whereas, in the second realm, both the good and the bad kingdoms are ruled by.... queens! Men only play secondary roles. This is the trend of movies and stories we were raised to. The same story boards the new generations are brought up watching. When a woman becomes a president, people applaud. When a woman heads an organization, people talk of her accomplishments. When a woman gets married, people make it sound as though her life was over "she could have done so much". Wouldn't that be the source of my feminist nature? I can't help but wonder whether I was brainwashed into becoming so ambitious. On the other hand, when a man cooks, people compliment him. When he does the cleaning, people say "what a catch". When he takes care of the kids, all women want him. What does the future have in store for us, in light of all these gender roles reversing positive incentives? Media can be so powerful in transmitting thoughts and ethical perceptions. If it can sell the tangible goods, why not the intangible thoughts? I think the time will come when the roles of women and men will be completely reversed. Marketing analysis is often confused with market analysis. Just like sales is often confused with marketing. Is there a difference? Yes, and an intrinsic one. Marketing analysis is conducted to analyze your marketing processes (refer to the marketing mix). Whereas, market analysis is a study regarding a specific market, assessing the environment where the business operates or aims to conduct activities. Marketing analysis is somewhat a self-prognostic internal assessment (evaluation conducted by using reference points such as sales results, brand awareness, etc.) whereas market analysis is an external environmental assessment (including studies like PEST analysis, SWOT analysis, and more).
" 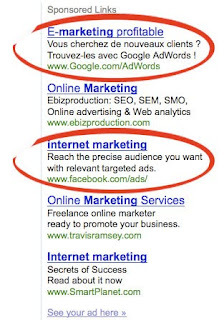 Internet marketing " are the words you have to type into Google to get both Google and Facebook online advertising messages under the adwords section. 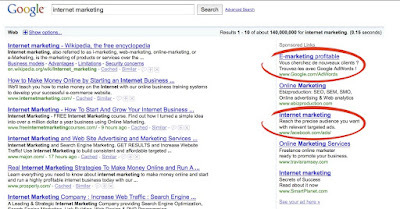 Let's learn Search Engine Marketing (SEM) from the giants! I also find ridiculous that even Google has to rely on SEM, and were unable to rank in the first page through SEO in the organic search listings. So we saw Facebook advertising in Google adwords. What's next? Google adwords advertised on Facebook?